In a later section of the chapter, we explore the MRP process and its components in more detail. Because MRP requires accurate inventory records (which should lead to reduced inventories and improved customer service), it seems to have had its greatest success in businesses with chaotic inventory histories. MRP is a push manufacturingapproach; therefore, it is geared to companies with mass-production assembly lines. 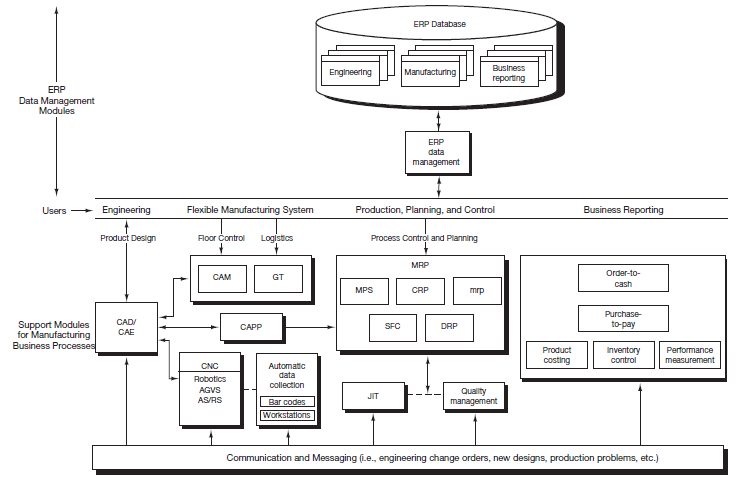 In contrast to MRP, a just-in-time (JIT) approach to production planning and control is predicated on pull manufacturing. Several objectives inherent in the JIT approach are summarized in Table 14.1. Finally, adaptations of JIT inventory control have some companies allowing vendor sales representatives to access electronic information on production and sales forecasts, and to place purchase orders just as if they were the companies’ own employees. Orders are sent using either a standard EDI- or an XML-based template. In the retailing environment, initiatives such as these are called quick-response replenishmentprocesses or vendor-managed inventory processes. Major impediments to implementation have been the mistrust and hard-nosed price negotiations that characterize traditional customer/vendor relations, as well as reluctance to share previously confidential information and technology with suppliers. However, as e-business continues to drive purchasing costs down, manufacturing organizations will have to alter their purchasing processes to survive.